More often than not, I have my sister Melissa to thank for my new recipes (remember the quinoa-pumpkin seed granola?). She loves to cook and is always up for trying new things. We both tend to read cookbooks (and now cooking blogs) like novels. Do you do that? Honestly, I could read cookbooks for hours on end. Here's one of my favorite appetizer/snack recipes Melissa introduced me to. It's one of Giada's from the Food Network (you can click here for the original recipe). The whole wheat pitas are nice and health. I can eat the pita chips alone, but the chive dip (not quite as healthy) makes them really amazing! You can click here to print my version of the recipe. Next time you need a crowd-pleasing appetizer, give these a try. I promise they won't disappoint! 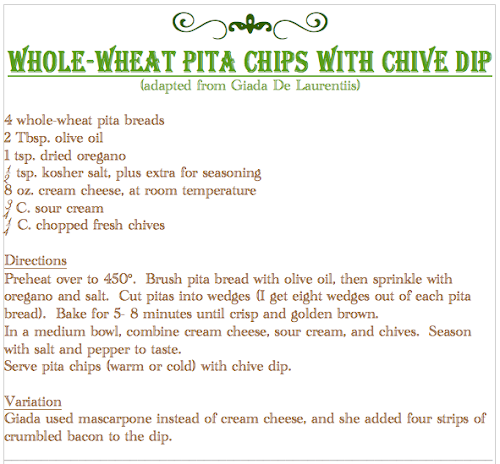 The chips also keep really well in an air-tight container, and the chives in the dip are even more flavorful the next day. This looks great! I may try it this weekend! It is so delicious! I hope you do try it, so you can enjoy it as much as I do. Let me know how it turns out. Thanks so much for taking the time to visit. I love this recipe! 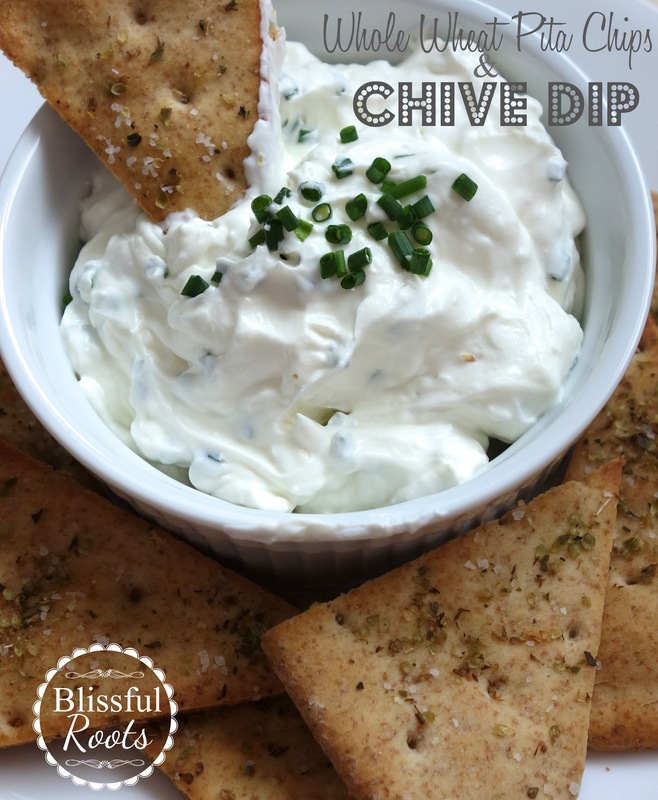 I am a big fan of Tazikis dill dip and I think this is really similar. I'm always looking for healthier snack options and I can't wait to try this! Thanks for the recipe! Hi, Kinsley (cute name!). I hope you love this snack as much as I do! Tell me what's in Tazikis dill dip? I haven't ever heard of it. I'm so glad you stopped by. Thanks so much! Come back any time! Hi there! This looks so good! Big fan of anything chive! Found you via link party this morning...been looking through your blog and LOVE it! Love your design and background! Would love for you to visit me as well!